There are lots of challenges now on FB and they give an image for us to play with. Newest of challenges is the Sasayaki FB Challenge and the image is Fantasy Angelina. Posted by Unknown at 11:26 AM 0 "kind encouraging and inspiring words"
Enjoyed making a card for the September FB Cute as a Button challenge. Image for the men. Since one of my dogs and me are the only minority gender in this house I love any digi's which are for men. Image colored with copics. 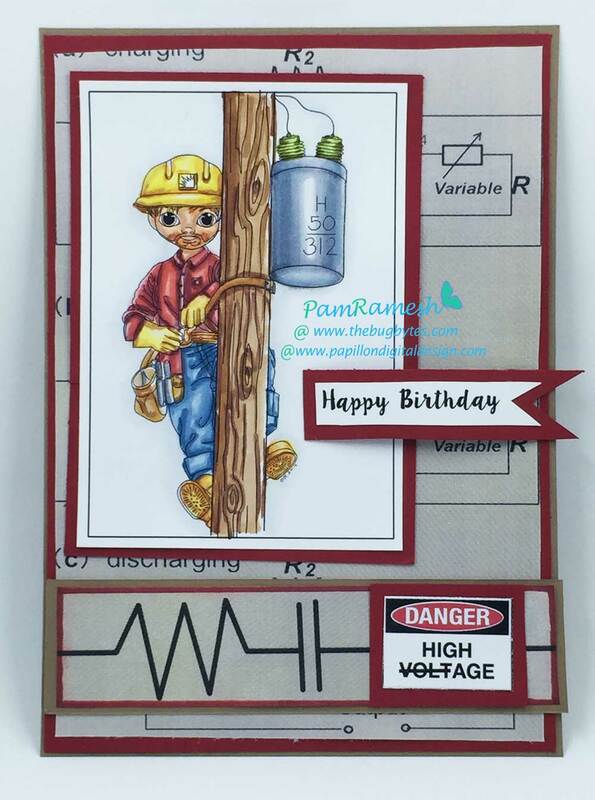 Loved playing with sentiment danger high voltage. If you want to learn coloring using copics or pencils do check out kitandclowder . Either their techniques classes or monthly classes. One of the monthly classes had as a freebie class coloring metals and also timber. You can also join the FB group and get lots of inspiration. ALyce Keegan is so helpful and wonderful. From the time I saw this explosion card on youtube by Karen Burniston I had to give it a go. And the ArtbyMiran FB Challenge goddess image was just perfect for this. I have used various dies. The circle behind which the image sits on is the beautiful tattered lace pearl die which after waiting for so long for it to come out again I got at last from hixxysoft. Awesome place to get dies from if you want those available in UK. 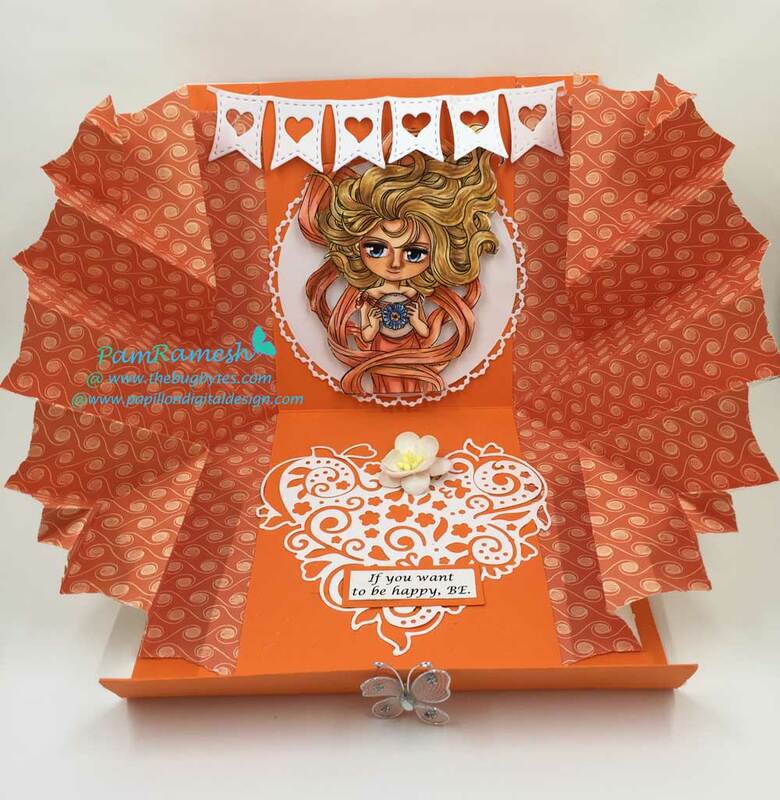 The flourish heart is a retired tattered lace die. I think this is the negative of the die. That too looks beautiful as the positive. The banner is from lalaland crafts. 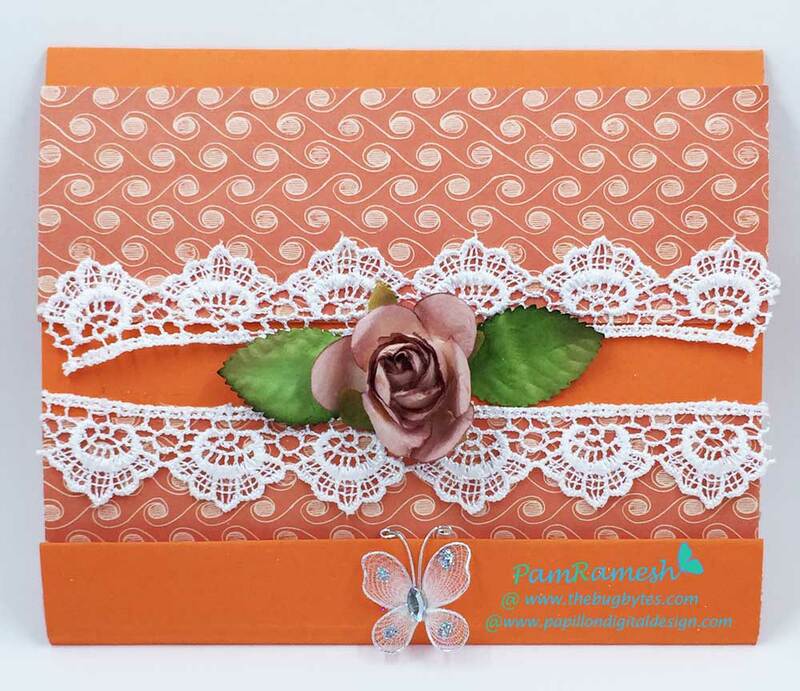 Some flowers and lace and a butterfly complete the card. The butterfly sits on a magnet. I used basic grey magnetic snap closure. The image is colored with copics. Mainly the YR2's and R2's for dress ; E5's YR2's for hair and for face and skin E13, E11, E00, E000. Bit of blue for flower and eyes - B23 and B00. Sentiment just typed in photosop. Posted by Unknown at 6:52 PM 2 "kind encouraging and inspiring words"
Posted by Unknown at 11:22 AM 0 "kind encouraging and inspiring words"
I am loving the challenges in FB group to create and make projects. 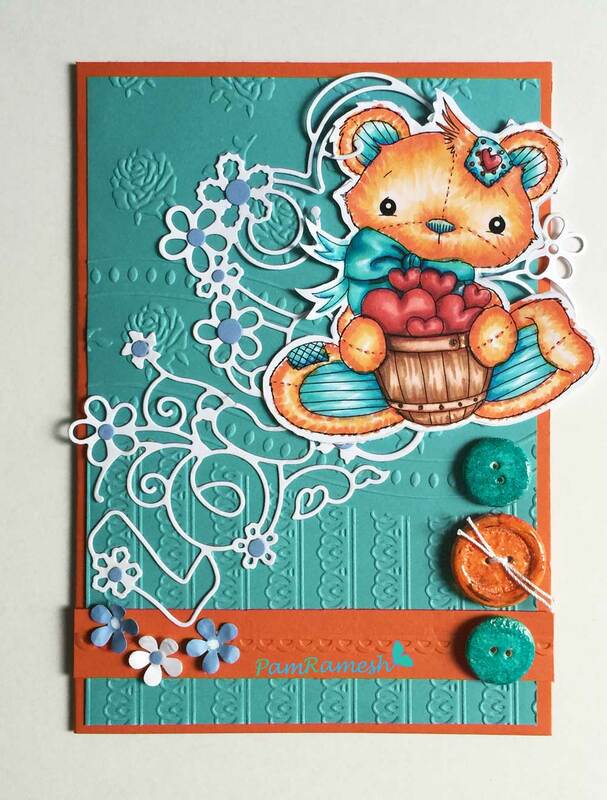 I made this card for the Orange and Aqua challenge using Jenn Nilsson digi for their FB group . Used this cute teddy bear image. You can buy their digis either in their etsy shop or at Miss daisy stamps. The image is colored using copics. 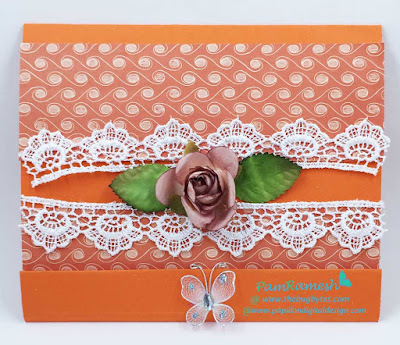 I have used tattered lace embossing folders for border and background. 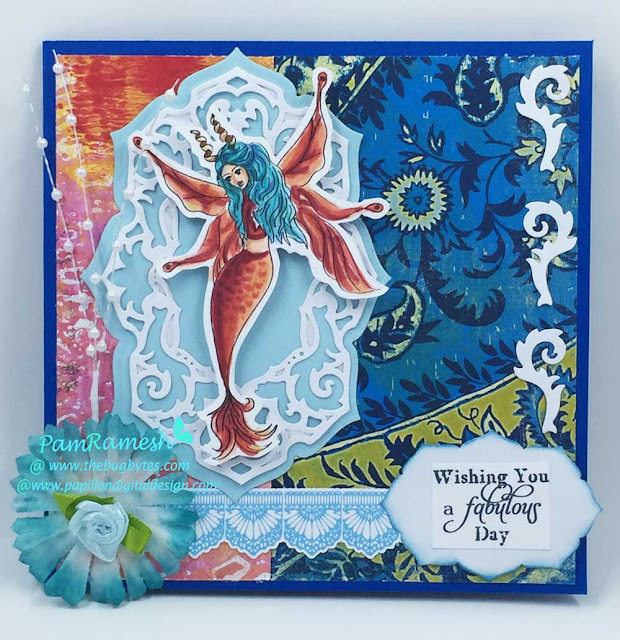 The love die cut is from Cheery Lynn die. Ek success punch and buttons complete the embellishments added. 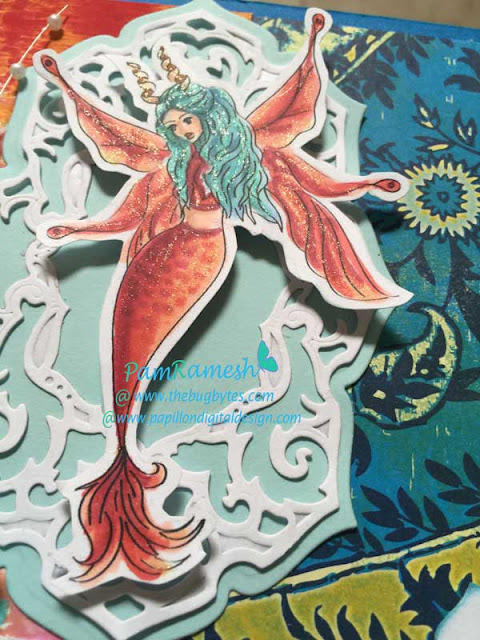 The buttons are clear acrylic buttons embossed with white embossing powder and then colored using copics and again embossed with clear embossing powder. They look like wooden buttons don't they? This way they are always the right color for the project. Posted by Unknown at 11:29 AM 0 "kind encouraging and inspiring words"
Made this card for my kids to give to their dad on his birthday. 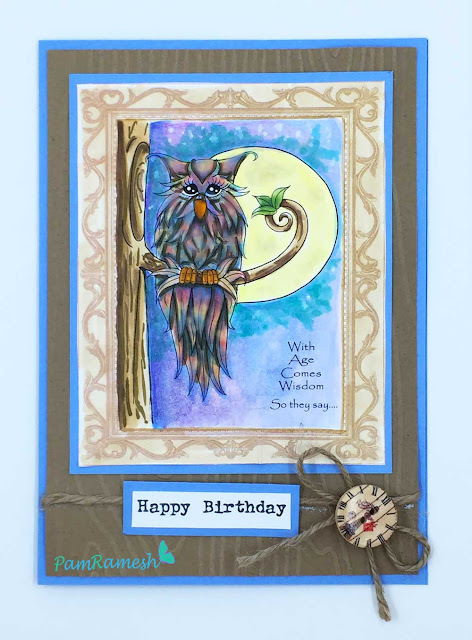 I liked this wise owl from Scrapper's delight. The frame is using photoshop . Posted by Unknown at 10:28 AM 0 "kind encouraging and inspiring words"
This is the 2nd card I made this week. I wanted to try out parchment crafting. Need to use a magnifying glass though I think. 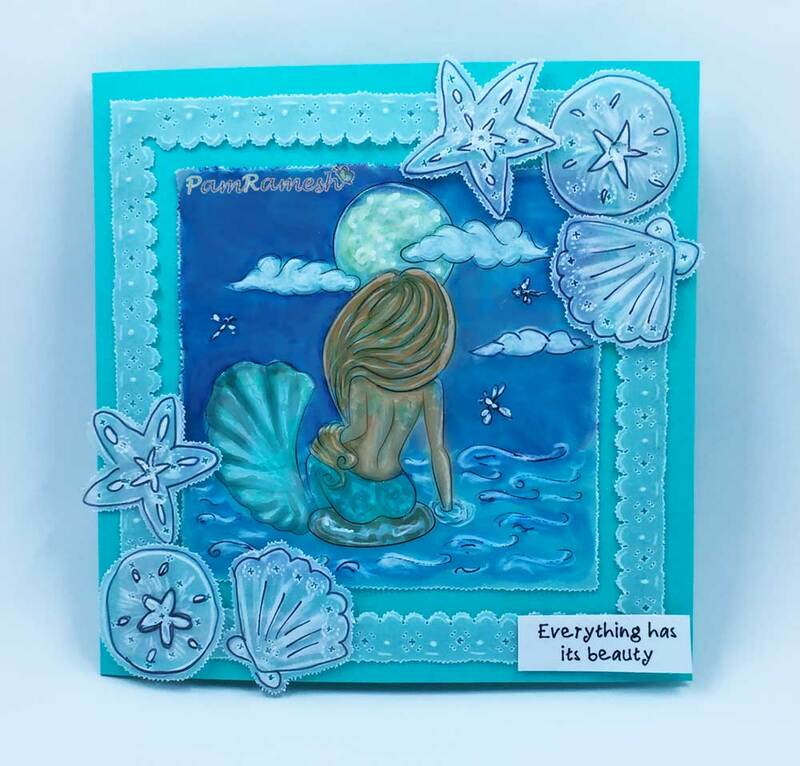 I have used moonlight mermaid image by Artbybarb. The sand dollar, sea shell and starfish were drawn freehand and then embossed perforated and cut using parchment/pergamano tools. The image colored/tinted a bit using copics. 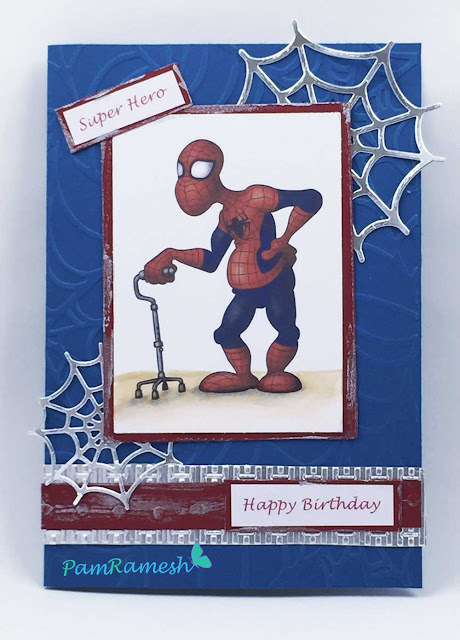 Made a couple of cards and enjoyed playing with my craft supplies. This one is a card for Scrappers Delight FB september challenge. I printed the image on a free background. 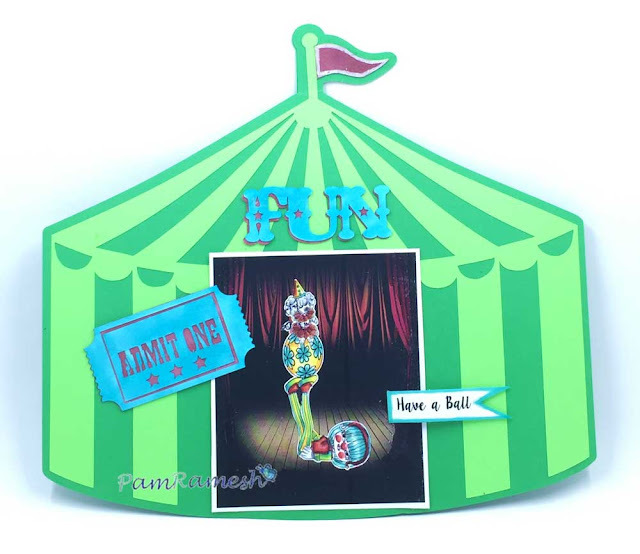 The circus tent and the ticket and word die cut are all cut using cricut explore. the word and ticket wee all cut on white cardstock and then colored using copics as I did not feel like loading cutting mat many times for each layer. I gave the girl a clown look so decided to leave her face white and give her a clownish nose and cheeks. Posted by Unknown at 7:32 PM 0 "kind encouraging and inspiring words"